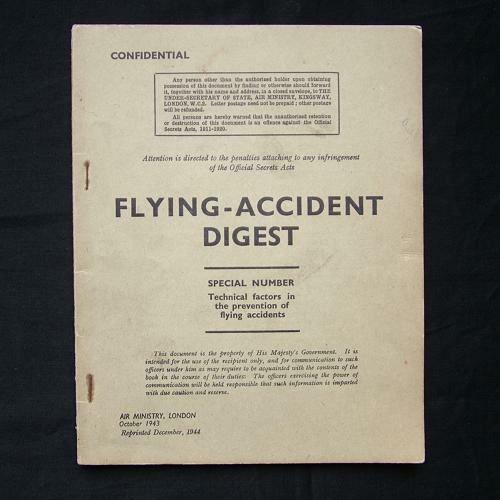 Flying - Accident Digest - Special Number 'Technical factors in the prevention of flying accidents'. Air Ministry, London, October 1943 (1944 reprint). Approximately 16.5 x 21cm, 41p. Booklet attempting to state in what ways existing designs of engines, fuselages, undercarriages etc. contribute to the exisiting accident picture. It then suggests ways in which these designs could be modified to reduce the flying accident rate. Information on accidents caused by the engine, undercarriage, airframe, during flight, on the ground, by fire, human error and so on. A very interesting document. The cover is faded and staples are corroded, otherwise in good condition. Stock code P22873-91.